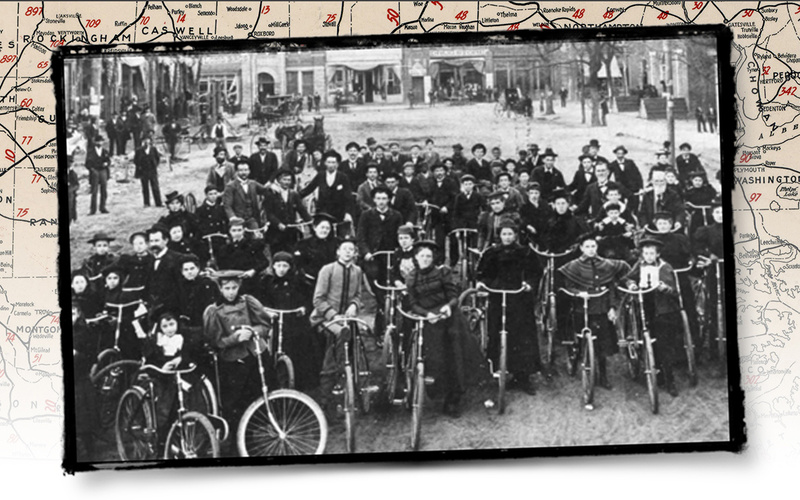 A bicycle fad in the late 1800s paved the way for The Good Roads Movement. 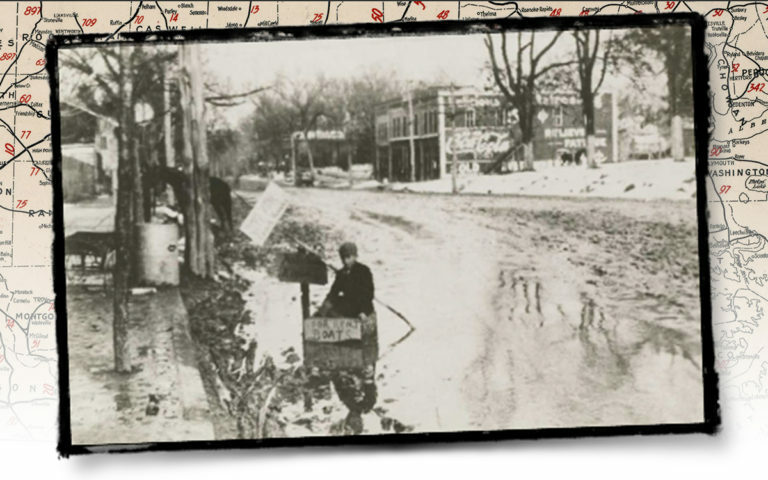 When North Carolina motorists started seeing better roads in the early 20th century, they owed a debt of gratitude to the concerted efforts of bicycle riders of the late 1800s. Bicycle enthusiasts were early activists in a nascent lobbying effort that would blossom into the influential Good Roads Movement. 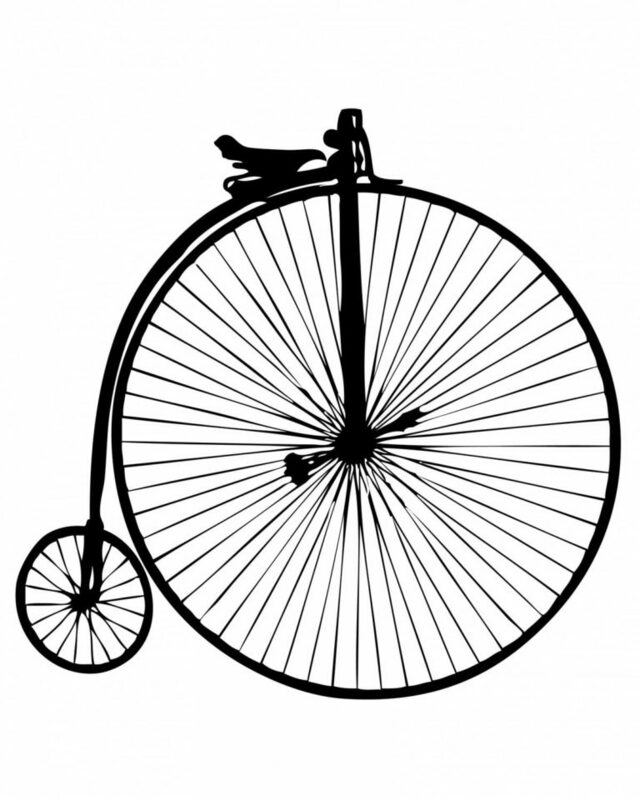 As the safety bicycle replaced the penny-farthing, a cycling fad gripped the country. Early bicycles – with huge front wheels, no gears, and iron-clad wheels – were challenging to mount difficult to ride, and dangerous to stop. Use of these “penny-farthings” or “boneshakers” was limited to “spry, daring young men.” For women in long dresses, bicycling was an impossibility. In short, early bicycles were not particularly useful or popular. But in the late 1800’s, creation of the “safety bicycle” – essentially our modern bicycle – opened up cycling to the general public and unleashed a bicycling craze that swept the country. Cycling clubs sprang up everywhere, including the one pictured above in 1897 Oxford NC. (Notice how wide the street was in a day before autos.) At the national level, the League of American Wheelmen had over 100,000 (whites, only) members, including Jacob Astor, Diamond Jim Brady and John D. Rockefeller. The organization lives on today as the League of American Bicyclists. The League of American Wheelmen lobbied for good roads for bicyclists. Later, in North Carolina, Harriet Morehead Berry championed the cause for motorists. The League of American Wheelmen, through its Good Roads Magazine, lobbied for better roads on which to pedal. Little would come of the bicyclists’ political efforts, but their fledgling “Good Roads Movement” would resurface in the 1920s. As more and more horseless carriages took to the roads, motorists revived the movement’s name and renewed the demand for better roads. And they achieved far greater success than the bicyclists had. In North Carolina, Harriet Morehead Berry led a populist movement that was instrumental in getting the legislature to move forward on road improvements across the state. The popularity of bicycles wasn’t all positive for the coming of motor cars. As city-based cyclists explored country roads, they gained a reputation for insensitivity to rural norms. It was said they frightened livestock, left picnic trash on lawns, spoiled wells, and helped themselves to fruit in the orchards. When the advent of motor cars brought a new generation of city dwellers on Sunday excursions into the countryside, farmers remembered the damage done by bicyclists. They saw more of the same behavior in motorists, and they dismissed the motor car as a plaything of the urban elite.